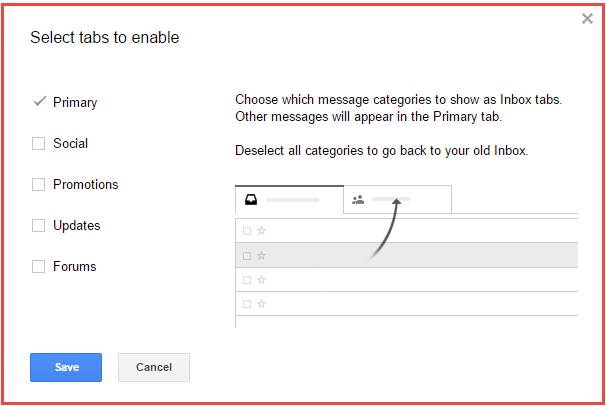 Google Mail or Gmail has a feature that sorts all your email in Inbox in to 5 or more special categories. These are ‘tabbed’ categories; the usual ones are: Primary, Social, Promotions, Updates and Forums. Also called as Smart Labels. For many, this feature is a good one. But for some, this update was little annoying as some people are used to seeing all emails under the same Primary heading – all at one place. Now that was only a quick fix to get your dream view! How about a permanent tweak so even after you sign out and sign in it shows the way you want it to? How to remove Smart Labels setting in Gmail? 1. Click on the + icon at the end of the category tabs. Now you can see all emails just flowing in without showing under various categories. What to do if you want to use the tabs or Smart labels again? Simple. Just hit on the SETTINGS gear icon. Check the boxes you want and Presto! You got’em back!!! Will be glad to know if this helped you. Please leave your thoughts in the comments section.